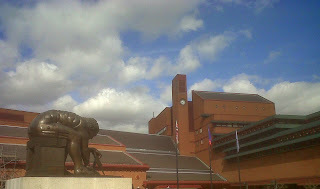 The British Library has recently published Growing Knowledge: The British Library's Strategy 2011-2015 its strategy document for the next four years. This provides a useful insight into the key priority areas which the library has identified, and adds detail to the 2020 Vision document, which was published last year. I've also been having a look at some of the submissions published so far on the Independent Review of IP and Growth website. So far, this just seems to be a selection of the submissions recieved (the consultation deadline was 4 March), but the JISC (Joint Information Systems Committee) contribution is interesting - discussing copyright issues surrounding orphan works, digitisation projects, open educational resources and the advantages of open access publishing. It also refers to a British Library document Driving UK Research: Is Copyright a Help or a Hindrance? detailing researchers' personal experiences of copyright issues. Between 1709 and 1911, copyright was linked to the requirement for the deposit of copies of every published work with a selection of "copyright" libraries. Although these functions (copyright and legal deposit) have now been separated in legislation, the requirement to provide copies of every work published in the UK to each of the 6 legal deposit libraries (the British Library, National Library of Wales, National Library of Scotland, Bodleian Library, Cambridge University Library and Trinity College, Dublin) remains. Another consultation has recently considered the implementation of extended legal deposit provisions to cover non-print materials, building on legislation originally passed in 2003. There's some useful information about this on the Consultation on the Draft Legal Deposit Libraries (Non-print Publications) Regulations 2011 website.